NexThought Monday: Our Top 5 Tips for BoP Marketing: What are yours? Earlier this year, Living Goods was featured as one of the pioneer social enterprises at Hystra’s Marketing Innovative Devices to the Base of Pyramid workshop and conference. It was a meeting of the top minds across the globe working to build robust markets for high-impact products. Alongside 14 other pioneers, we spent two days deconstructing marketing methods, debating best practices, and developing new ideas to drive impact and profits. While we didn’t emerge with a foolproof playbook for Base of the Pyramid (BoP) marketing – nor did we expect to – we did walk away with a fresh perspective on our respective strategies, key principles to not lose sight of, and an abundance of ideas to test. 1. Risk rules behavior. Too many marketers focus on price sensitivity when talking about BoP consumers. More often than not, they should be talking about risk sensitivity. As our friends at Hystra put it, “BoP consumers don’t want cheap products, they want risk free solutions.” Risk sensitivity is a key challenge for new products. Consumers’ cash flow at the BoP doesn’t leave much margin for trial and error. Customers need to be convinced that they are making a good investment, no matter what the price. Many are even willing to a pay price premium to reduce their perceived risk of buyer’s remorse. For example, Toyola offers customers an 11 percent discount on a $10 stove if they pay cash on site. Yet most customers forgo the discount and opt to try the product for a month. Convinced of its benefits, customers happily pay full price at the end of their trial. And nearly everyone who tries, buys. When marketing a new product to BoP consumers, framing the challenge as one of risk, not price, is a good place to start when developing your strategy. 2. Brands matter. If risk rules purchase behavior, a strong brand is surely a BoP marketer’s best friend. Indeed, brands were the first form of consumer protection to emerge from the industrial era. Brands make firms accountable to their customers. And well-built brands are a storehouse for consumers’ trust, loyalty, and advocacy. Clearly, branding has grown far more sophisticated, as have consumers. But as we wrote in a previous post, well-built brands are a powerful asset for both organizations and the risk averse customers they serve. 3. Create the category. For many products and services seeking to penetrate the BoP, there is simply no demand for what they are selling. More often than not, marketing at the BoP needs to focus on creating the market – conditioning consumers to consider purchasing a given product or service. It’s not about building brand differentiation within an established category. It’s about establishing the category itself. As is the case in any market, we’ve found it is far easier to get consumers to switch to superior products within an established category than it is to get consumers to consider shelling out their shillings on greenfield goods. For example, our clean burning cook stoves are a superior alternative to the inefficient traditional, dirty burning stoves polluting the homes of our consumers. Our stove is an easy sell in an established category – we’ve achieved over 50 percent clean cook stove penetration across the communities we serve. On the other hand, clean water is a much harder sell in our markets. Most consumers decontaminate their water by boiling. Although they typically don’t bring their water to an effective, germ killing boil. Regardless of the end result, our consumers don’t pay for a safe water product; they clean their water for free. Clean water is not a part of our customer’s purchase behavior – at least not directly. To build the market for new products and services, marketers need to encourage consumers to adopt the lifestyle – the new routines and behaviors – that surround their new product. Creating the category is a much different challenge than differentiating a brand within an existing category. 4. Cue the herd. Okay, so how do you get consumers to adopt new behaviors and lifestyles that align with your product or service? To start, simply beating them over the head with your USP won’t cut it. If nothing else, there is one trait all consumers across all markets share – they are all predictably irrational. We like to think we are rational, independent decision-makers. In reality, we do what we do largely because of what we see other people doing. The herd mentality of consumer behavior is an undeniable force. To effectively drive adoption of new behaviors or products, marketers need to find ways to signal and amplify consumer adoption – we need to catalyze copying. For example, to get pregnant mothers to alert us within 48 hours of delivering their newborn, we give all newborns a free branded baby cap. A simple, visual cue to their community that the mother received a post-natal follow up within 48 hours of the birth of her baby. An otherwise private behavior, made public. A signal to the community for others to copy. Simple messaging works too. To get hotel guests to reuse their towels, the message “most guests at our hotel reuse their towels” is 26 percent more effective than a message about protecting the environment. For a roundup of other excellent examples of social norming strategies to drive behavior change check out this NY Times Fixes column. 5. Marketing as a service. To win consumer trust, marketers need to do more than build awareness or differentiation. They need to turn they marketing into a useful service itself. The avalanche of branded mobile apps provide plenty of examples for developed world consumers. Charmin’s Sit or Squat app is a great example – a free mobile app to help you find a public restroom, complete with user reviews. At Living Goods, we also use mobile technology to provide such services to our customers. 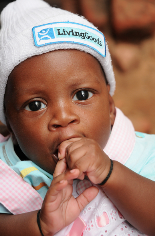 We send automated SMS adherence reminders whenever we treat a child for malaria or diarrhea. Simple SMS reminders are a much-appreciated service for mothers with countless competing demands on their time. We also developed our version of a Text4Baby service to support pregnant women and newborns. Of course technology isn’t a prerequisite for marketing as a service. Toyola’s ‘money box’ is a simple, powerful consumer-financing scheme that doubles as powerful product marketing – made possible with a simple tin can. These top five tips are by no means an exhaustive list of effective strategies for BoP marketing. We left out a lot of more obvious stuff out; you can read about the four Ps, why word-of-mouth rules, and the importance of influencers elsewhere. Our aim here is to spark a fresh discussion on BoP marketing. What BoP marketing strategies are working for you? What strategies have failed? What do you think we should test? Share your tips, tricks, and thoughts on our take in the comment section below. Let’s build this market for good. Chris Murphy leads consumer marketing, corporate communications, and business development at Living Goods.